"There will be no honeymoon period for McCarthy, but the fixture list has at least given him a relatively soft landing." 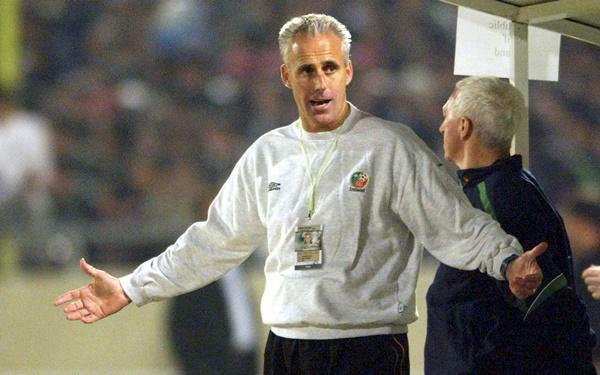 In late 2002, after a dramatic six-and-a-half years in charge, Mick McCarthy left his post as Ireland manager with the feeling of unfinished business. The shadow of Roy Keane hung over his final months, and the break-up was painful. He was always open about his willingness to come back and was in the shake-up before the FAI appointed Martin O'Neill. On Saturday evening in Gibraltar, he begins his second stint in charge after getting the nod to replace O'Neill - although his return is only scheduled to be short term. Stephen Kenny will take over from McCarthy after Ireland's Euro 2020 journey ends. The experienced McCarthy was viewed as the safe pair of hands to secure Ireland a place in a competition that they will co-host. It's essential that the Football Association of Ireland maximise the profit from that opportunity. There will be no honeymoon period for McCarthy, but the fixture list has at least given him a relatively soft landing. An away date in Gibraltar should provide him with a winning start, although concerns about the plastic pitch and the impact of the wind on an exposed pitch should guard against complacency. Gibraltar did enjoy the UEFA Nations League experiment with victories away to Armenia and at home to Liechtenstein a refreshing break from their reputation as whipping boys. They were adamant they wanted to host this match at the Victoria Stadium although UEFA needed a bit of convincing about the suitability for traditional qualifiers. The 2,300 capacity venue needed significant upgrades. Their part-time team believe they are capable of making life uncomfortable for the guests and their coach Julio Cesar Ribas does have some giant killing experience. He was in charge of Lincoln Red Imps when they shocked Celtic at this venue in Brendan Rodgers' first game as Celtic boss. The main feature of the strained final days of Martin O'Neill was Ireland's ineffectiveness in the goalscoring department. Double headers in October and November passed by without a goal. And there wasn't exactly a huge amount of opportunities created either. In that context, this is a chance for Ireland to regain some confidence. McCarthy is without Shane Long, while Jon Walters has announced his retirement from football. Sheffield United's David McGoldrick has been recalled after being out of favour under O'Neill. Luton's James Collins is also in the squad for the first time. Injuries to Callum O'Dowda and Alan Browne have also affected McCarthy in midfield, while Declan Rice was still technically an Irish international when he assumed control. A big task for the new boss will be to draw the best out of Robbie Brady and Jeff Hendrick with the Burnley duo struggling to make an impact in green since they starred at Euro 2016. Brady might even miss out here. Wolves' Matt Doherty has been the form Irish player in the Premier League this term and the challenge for McCarthy is where to accommodate him given that skipper Seamus Coleman is likely to feature at right back. Therefore, it's the Goals related markets that are most likely to energise punters. This could be a game to dabble on the Correct Score where the [1.97] about Any Other Away Win stands out as the safest proposition. That's basically any Irish victory where they score four goals or more. For all that Gibraltar improved in the autumn, they did concede six goals against Armenia in their final home match. Granted, local expectations for that game were high and an early goal for the natives built up the excitement levels. Preston's Sean Maguire is expected to take a prominent role in this match and is worth backing to open the scoring at 7/2 on the Sportsbook. The one caveat here is that Maguire has suffered problems with his hamstring and therefore his participation on the artificial surface might be curtailed. However, he's the best number nine in the squad and is desperate to kickstart his Irish career . He's been taking tips from coach Robbie Keane who excelled in this type of fixture. Expect the 24-year-old to enjoy a landmark day.